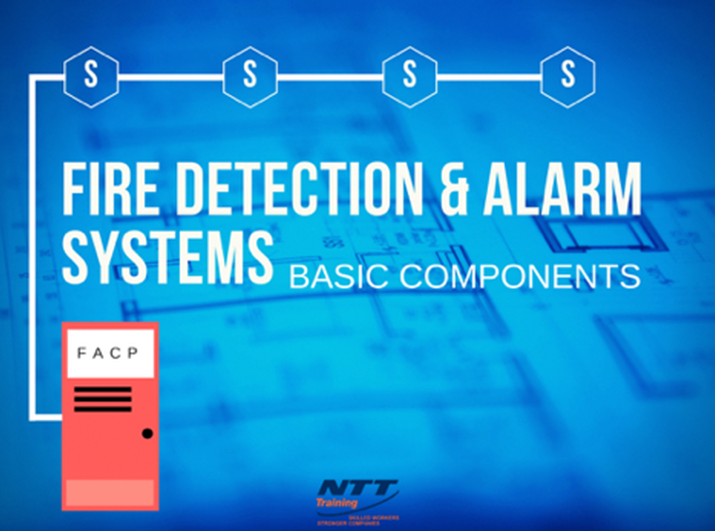 NTT Inc. - What are the basic components of a fire detection and alarm system? What are the basic components of a fire detection and alarm system? Modern commercial and industrial fire alarm and detection systems are complex and constantly evolving as technology changes. Understanding the components included is a big step in troubleshooting any issues that emerge from these vital systems. Typically, a commercial fire system will include a variety of initiators spaced intelligently throughout the building with a combination of manual and automatic devices. These are connected to a central control panel via initiating device circuit. The fire alarm control panel is the central brain which monitors and manages all of the initiating devices and sends signals to indicating devices if an issue is detected. The control panel typically contains standard branch-circuit writing and replaceable circuit cards. In conventional alarm systems you will generally find a circuit card for each designated zone within the system. For newer, more technologically advanced systems, you would find digital circuits that transmit data to all devices that can be zoned with programming. In each fire alarm control panel, you’ll also find a display that informs you of the system’s status with troubleshooting codes and a touchpad to manage the system directly. From this system you can disable alarms, signal alerts, reset the system following an issue, and reprogram when called for. In addition to the direct wiring into the building’s power supply, there are typically UL Listed emergency batteries in sealed units to prevent a disruption of fire protection in the event of a power outage. These are typically 6V or 12V batteries linked in a 24VDC power-limited system. These may be located within the control panel itself or in a separate enclosure mounted adjacent to the main control panel. They usually are connected to the FACP to charge and monitor them. These devices allow the system status to be checked, the alarms to be initiated or silenced, or various safety components to be activated or deactivated throughout a building or even in remote locations. These are typically reserved for larger systems installed in high-rise buildings and where local code dictates that the fire alarm system be able to be controlled in remote locations other than the main FACP. Newer fire alarm control panels utilize digital systems (intelligent arrangement) which monitors each device, rather than only monitoring the circuits as traditional systems do. Both make use of circuit-based systems, the difference is in how fine-tuned the zoning, response and maintenance can be. Monitoring each initiator (and their relative position within a structure) allows a precision response from the system in the indicators and auxiliary devices. It allows for a faster response during a fire, where seconds can be vital. The detailed monitoring allows for speedier diagnosis. Technicians will be able to clearly see the exact location of a problem, meaning more time troubleshooting and repairing the problem. These systems also detect maintenance concerns and alert technicians so they can be addressed early.